Your woodlot is constantly changing, although the changes seem small. Even over a period of several years it may be difficult to see much difference, even in the growth of trees and shrubs. But growth is occurring, and most of it is hidden beneath the soil surface where roots are constantly searching for new opportunities. Tree crowns also expand if space is available in the forest canopy, and as new leaves are developed, the diameter and height of the tree increases. 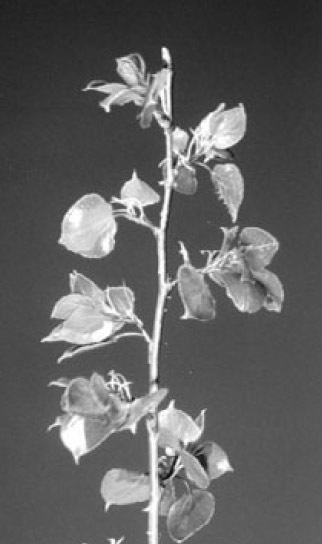 Figure 26a: Growth is reflcted in the crown, stem and roots of a tree. Roots are like underground branches: they provide nutrients and water, and anchor plants. The roots are where material is collected for use in food production, and are the primary connectors to all the natural cycles in the woodlot. As the plant grows new leaves or branches, new roots grow underground. 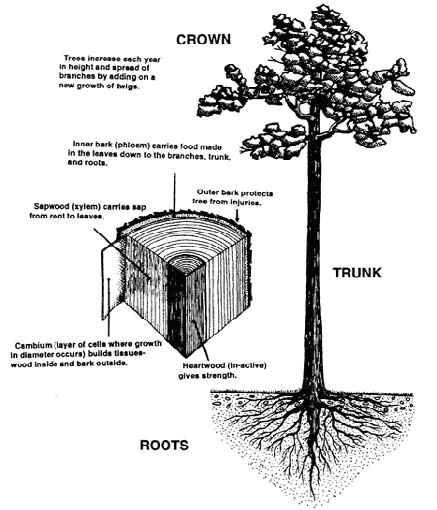 In trees, surface roots extend near the top of the soil and will spread at least as wide as the widest part of the branches and leaves which form the tree's crown. Most roots are part of a dense network of feeding roots that move through the top layers of the soil. The type of tree, type of soil, amount of available water, and the number of other plants growing nearby all affect the size and shape of the tree. The trunk or stem of a tree or a plant provides support and has an amazing array of vertical tubes called xylem and phloem that pass sap, water, and food from one part of the tree to another. The bark's function is to protect the tree during all seasons of the year. The bark of a birch tree is only about 0.64 cm thick, while the bark of an eastern hemlock may be more than 5 cm thick. The inner bark is soft and moist and is used to transport sugar from the leaves to the roots. The outer bark, which thickens as the tree matures, is usually harder and protects the tree from temperature changes, insects, and diseases. The thin layer of cells that is the growing part of the tree is called the cambium, and is sandwiched between the bark and the wood. The new layer of wood added to a tree each year appears as a ring in the tree stump. The number of rings can tell us how old a tree is, and the distances between the rings tell us what the growing conditions were like in the past. Tree rings are divided into early wood - the light wood between the dark rings, and late wood - the dark wood laid down as the tree's growth slows in late summer. Many people try to guess the age of a tree by looking at the diameter of the trunk. Yet there are many small spindly trees that are old. Usually these trees have not had enough space, light or nutrients to grow. 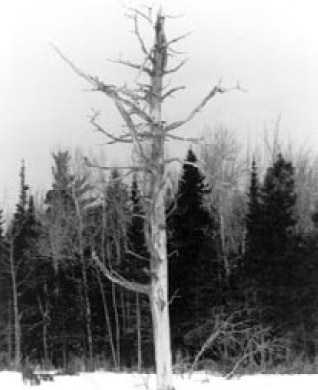 For example, black spruce trees that grow in wet soils become stunted, and trees that grow on barrens are smaller because they don't have enough nutrients. A tree's growth rings can also tell us information about climate, pollution, insects, wind, fires and other influences on a tree's life. The study of tree rings is called dendrochronology. Droughts may limit the width of a tree ring and insects and pollution will leave telltale bumps and markings. Fires will leave scars in the rings of surviving trees, and the wind can cause a tree to lean, resulting in compressed rings on one side. Each tree owes its appearance to the environment in which it has grown. In trees, flowers are necessary for reproduction. Many people are surprised that trees have flowers. The black spruce has small reddish cone-like flowers that may be hard to notice because they are near the top of the tree. These flowers depend on the wind for pollination so they do not have to attract insects. The flowers of an apple tree and smaller plants depend largely on insects for pollination, and they must be large and fragrant to attract the insects. A tree is ready to reproduce when it can produce flowers and seeds. The length of time it takes for trees to mature varies. A tree's ability to flower has more to do with size and growing conditions than age, so a crowded apple tree in a corner of your woodlot may be "old", but it may not flower because it does not have enough room to grow. In contrast, annual plants like dandelions produce a flower each year, and may take only 4 to 6 weeks to produce seeds. 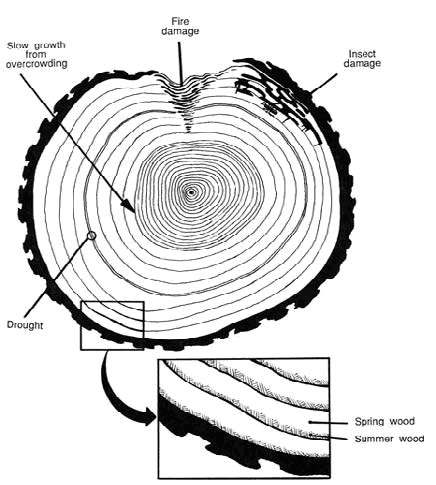 Figure 27: The study of tree rings can tell us many things about a tree's past. Trees such as pines and oaks have both male and female flowers on the same tree. Other trees are either male or female, such as poplar, willow, and ash. Cherry and elm trees, and most small flowering plants, have male and female parts that are combined in one flower. Tree reproduction begins when pollen released from the male flowers fertilize female flowers. The pollen is carried by wind or by insects. The result of fertilization is fruit or seeds. Trees produce seeds which vary in size and shape at different times. Softwoods are called conifers because their seed is enclosed in a cone. Trees don't produce seeds every year. Generally, intolerant trees such as poplar and birch have a shorter amount of time between each period of seed production. Slower-growing, tolerant trees such as hemlock and sugar maple have longer intervals between seed production and generally produce fewer seeds. Figure 28: Good seed trees are important components of a healthy woodlot. Comparing red maple and white pine trees provides a good example of the different timing and release of seeds. A red maple flowers early each spring and releases thousands of small seeds about 4 to 6 weeks later. Each seed contains the ingredients for a tree, an enclosure to give it food for the first year of life, and some sort wing to help it move in the wind or water. Seeds can also be carried by birds and animals in their feathers, fur, and intestinal systems. By contrast, the seeds of a white pine tree need two years to develop and are released in the fall or winter to lie on the forest floor or blow across the snow surface. In the spring they germinate and grow. White pine produces a good crop of seeds about every 3 to 5 years. Trees also reproduce by vegetative reproduction. Some trees, like black spruce, can reproduce by layering. A low branch from a tree may take root in the soil and can develop into a tree that is genetically identical to the parent. 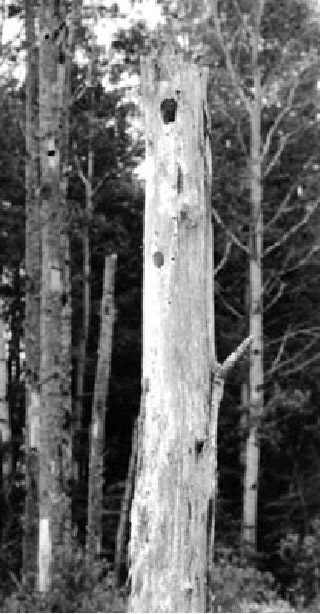 Other species, including most hardwoods, can reproduce by stump sprouting if the tree is cut or injured. Dormant buds in the stump produce new shoots that compete for space and light. Some stumps may produce dozens of sprouts. Over time, the dominant sprouts survive to become new trees. Some hardwoods can reproduce by root suckering, in which root buds ?ush to become new trees. Aspen and beech are examples of this method of reproduction. 1. Pioneer trees (grey birch, poplar, cherry) quickly establish following a disturbance such as ?ooding, ?re, or cutting. These trees don't like shade and grow quickly. 2. Intermediate trees (black spruce, white pine, red oak, white ash, red maple) can handle a little shade until some kind of disturbance helps them ?nd a gap to grow more quickly. 3. 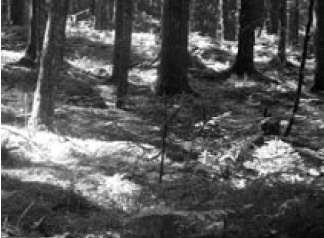 Shade tolerant species (red spruce, sugar maple, balsam fir, beech, eastern hemlock) can grow in the dark, shady understory of a forest. Sometimes spaces are created for them when the bigger trees around them die or get blown over. 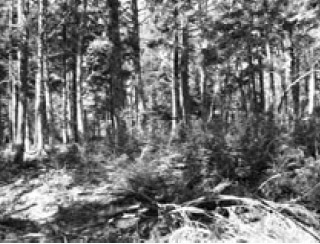 Figure 29: Red spruce and hemlock regenerate successfully in the shade of their parent trees. Other factors like soil temperature, moisture, and animals determine how well a seed germinates. Because seeds need heat to germinate, the soil's warmth can be important. Generally, more heat is absorbed on dark coloured surfaces because lighter surfaces reflect heat. Seeds also need adequate moisture to begin germination. Dry springs and early summers (when many seeds are released) will create poor germination conditions. When it�s too warm and dry, seeds may lie on top of the soil and dry out before they can germinate. Animals play an important role in spreading, planting, and starting seeds throughout the forest. Animals and birds in your woodlot may plant a seed for you in their own manure. Some seeds go through the animal's digestive system where juices help to soften the seed. The seed is released as part of the animal's regular daily waste. In addition, the pellets of squirrels provide manure which contains bacteria and fungi that will aid the germination of the seed and provide fertilizer. 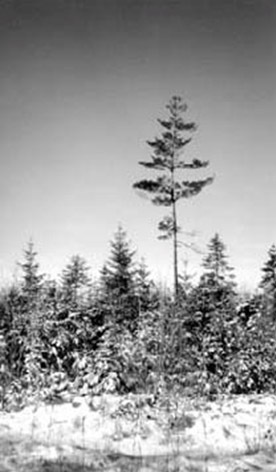 Figure 30:A red spruce seedling absorbs light and nutrients as it reaches for the sky. Animals and birds also make caches of seeds and forget about them. Blue jays, chickadees, and many rodents hide seeds some of which eventually grow. Other animals, such as moles, carry out tunneling which turns earth over in much the same way you would turn your garden over in the spring. The freshly turned soil creates a "garden" for seeds to begin growing. The most difficult time in a tree's life is getting established once the seed has germinated. Millions of seedlings perish in this delicate stage - animals and fungi destroy them and heavy rains wash them away. There are many reasons why seedlings have trouble getting started. If seedlings are not eaten or destroyed, they compete with each other for food, light, and water. Those that are best adapted for the site and those with superior inherited qualities will grow the best. Soil, climate, and water are primary influences on tree growth. Many trees do most of their above-ground growing in May, June and July when the water is plentiful and temperatures are not too warm. Early spring is the best time for planting and transplanting trees because they are still dormant, there is moisture in the soil, and the roots are just starting to become active. The plants will have the entire summer to become established. If plants and trees grow too late into the fall, the new growth will be killed by frost. Plant life in Nova Scotia is adapted to our weather and slow down their growth as fall approaches. Late summer and early fall are important times in the lives of trees as they are storing food for next spring. In winter, plants and trees are dormant. Plant and tree growth depend on how well nutrients are cycled in the woodlot. Different tree species have varied nutritional requirements and some trees can handle a low level of nutrition better than others. Generally, hardwoods require more nutrients than softwoods. Other plants growing near seedlings can inhibit growth because of their many small, fine roots which take up a lot of nutrients and water. Growth will also be inhibited if a tree is too crowded. In this case, not enough light, nutrients, and water are available for each tree because there are too many roots competing for limited resources. Trees that have been thinned grow more quickly because they have more space to obtain the important requirements of life, including sunlight. After light, water is the most critical element required for tree growth. How trees take up water varies, but they all use a vast amount. A single large tree on your woodlot can take up as much as a tonne of water from the soil every day. The ability of a tree to pump water is truly amazing. A suction pump can carry water no higher than about 10 metres. In a tall white pine, nature carries water up to 30 metres. Figure 31: Trembling aspen grows vigorously in full sunlight. Most of the water taken up by trees is absorbed through the roots. Less than 1 percent of the water that is taken up is actually used; the rest is eventually released (transpired) through the leaves and needles. As water is carried up through the tree it keeps the tree cool and brings with it most of the nutrients required for growth. Because tree growth is limited when water is scarce, soil water and moisture in the spring months are keys to a healthy growing forest. Lack of water in the late summer months affects trees as well. Some trees, like birch, which have a longer growing season are affected more by late droughts than pine, maple, ash, beech, and oak which do most of their growing in the spring and early summer. However spring growers may have trouble the following year if a drought affects the moisture of the soil. Compared to some other parts of the world, the lives of trees in Nova Scotia are relatively short. Balsam fir matures in about 40 to 50 years. Although white pine can live up to 450 years, the average age is about 200 years. The oldest living trees in Atlantic Canada are a red spruce in Fundy National Park that is 445 years old, and an eastern hemlock in Queens County, Nova Scotia that is 420 years old. Figure 32:Dead white pine trees make excellent snags for wildlife nests and perches. As we learn more about forest ecology, we have come to recognize a tree's importance as it dies and decomposes. Often called snags, cavity, or wildlife trees, they are used by many species of wildlife. It's estimated that up to one-quarter of wildlife species in Nova Scotia use dying or dead trees during their lives. Figure 33: As a tree begins to break up after death, it becomes habitat for many species of wildlife. As a tree ages, the bark loosens or becomes injured by fire, lightning, animals or humans. 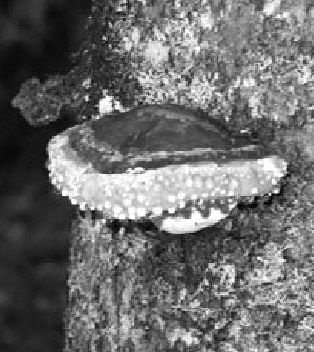 Injuries, such as broken tops, form entry points for various types of fungus which show up as conks on the tree. Insects start to invade the bark, making the tree softer and easier to penetrate. Carpenter ants begin mining the wood. Birds, like the pileated woodpecker that eat the ants, drill into the bark. The next spring a smaller woodpecker or other bird that lives in cavities or holes in trees, drills into this soft feeding area to make a nest hole. As the tree decays and the hole becomes bigger, it becomes a home for a family of flying squirrels or a group of wintering raccoons or a nesting area for a wood duck or merganser. A hawk uses the bare branches of the standing dead tree as a lookout post. 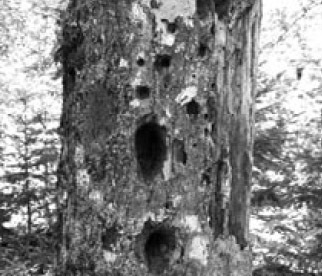 Figure 33: Cavity trees are initially excavted by woodpeckers, then used by other birds and mammals for nesting, feeding and shelter. The tree eventually rots and falls down as activity inside it increases. When the tree falls, a new section of the forest opens, creating space for new plants and trees to grow. The log, although dead, continues to shelter a multitude of life. Fungi, ants, mites, and other insects recycle the log, breaking it down into a smaller form. Other animals like spiders, centipedes, and salamanders come to eat the insects and find shelter. Earthworms and other soil animals eat the remains and their "casts" or waste become part of the soil. The log becomes useful to many different animals. Grouse (partridge) will use the log as a drumming spot. Small mammals use it as a nesting place. A salamander may bury itself under the log during hibernation in the winter. A porcupine family may live in the hollow. Figure 33: Dead trees are quickly invaded by fungi such as this conk. Fungi and bacteria grow in the decaying log. The fungi attach themselves to new tree roots; the bacteria help break down the litter even further. Thus the log further decomposes and feeds the next generations of trees. Eventually a new seedling can grow in the fertile soil left by the decayed tree, and the cycle begins again. It is important to leave as much woody material as possible on a harvested forest area. The wood will support many types of life and some nutrients and elements will eventually be returned to the soil.